In our Northern American tradition, it is common for expectant parents to spend a great deal of time selecting a name for their offspring. Parents try to find a name that is attractive and, in some cases, has meaning in an ancient language, like Greek. My youngest grandchild is not an exception to this tradition. Her mother, like most, plowed through baby name books, listened to requests/suggestions from family and friends, and then decided on the name Sophia for her first-born daughter. I know that Ashley (Sophia’s mom) chose the name for the beauty as well as the hope that the meaning would play out with great favor for the little one. The name, in Greek, means wisdom. And by my lens, this little girl is living up to the meaning of her name splendidly. If there had been any doubts of that, she put them to rest during our summer visits in 2014. Sophia, by just being herself, reminded us that the gifts of laughter, love, and life are all that really matter. She lovingly and patiently tutored us, in her different roles, within a matter of a few days. Throughout life, we find ourselves in positions where we have to navigate issues or circumstances by using the fine art of negotiation. We cannot always have our own way. Sometimes all of us try to convince another of our desires by pointing out the logical benefits to our particular requests. Sophia modeled Negotiation 101 in a pet shop one morning. 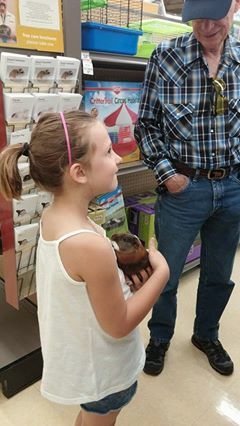 She patiently and persistently explained to her (apparently clueless) grandfather, that it was a good idea to buy a guinea pig for her as a pet. She made many promises about taking care of the animal, loving him, and being a friend to one of God’s creatures. She told Grandpa that it would definitely be okay with her mother – no need to call for confirmation- because this would be something to keep her (Sophia) busy, and mom would have more time with the new baby. She insisted that Mom would agree the guinea pig would be great company for Charlie, the Beagle. Personally, I never saw Charlie as a particularly lonely soul. But in Sophia’s eyes, his life was less than complete without another furry, four-footed friend. I was astonished at Sophia’s poise and presence as she pleaded her case before the high court of her Visa-carrying grandfather. I also secretly took notes to see what worked, and what did not work. You just never know when I might want a guinea pig, BMW, or something that does not immediately appear to be valuable to Grandpa. Sophia left the store without a new pet, but perhaps with a new respect for her grandfather, negotiator supreme and author of the soon-to-be-released book, “The Healthy Art of Saying ‘No’.” Still, the kid put on quite a show. My hat was off to her because I knew what she was up against. Sophia’s family is excited about her interest in reading, ability to comprehend, and her curiosity about almost every subject. She does not pass up opportunities to explore new books and topics. When we encountered a rainy day during our time with her, and the park was out of the plans, we made our way to one of her favorite places – the library. While Keith and I meandered through children’s books, our little charge made a dash toward the puppet box and the little stage made for puppet performances. It was there we were treated to a lesson, from Sophia and her capable assistants, about animal habitat. 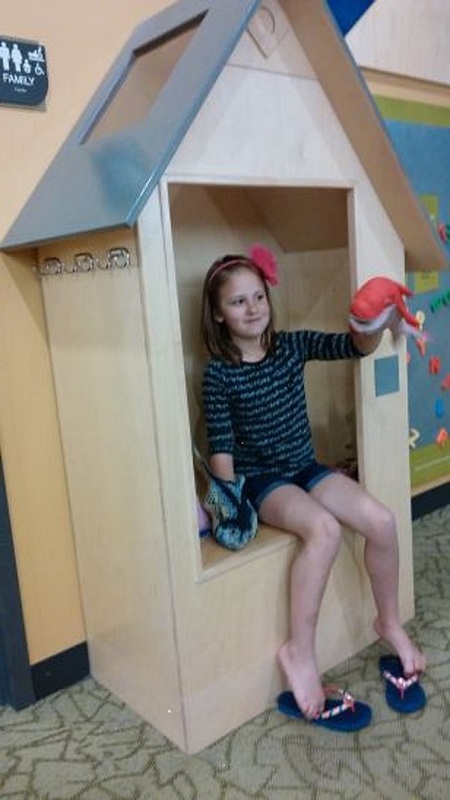 She took turns asking her captive, but delighted little audience members questions concerning the residences of various types of animals from birds to fish. If Gramma or Grandpa answered the question correctly, we were met with a big cheer, a smile, and an enthusiastic, “You are right!” from our instructor. Again, I took notes. As a teacher, I was impressed with her style of engaging and encouraging her pupils. I also learned that sharks do not live in lakes. Who knew? They say the apple doesn’t fall far from the tree. Well, in this case, the trees don’t leave the side of the little apple, even when our hearts palpitate at the site of her fearless endeavors. To Sophia, everything is worth a few minutes of investigation and trial – not necessarily in that order. She has no hesitation when taking on the most advanced playground equipment, or searching for life forms under rocks. She is a water hound who has been jumping into the deep end of the pool (without her float apparatus on, YIKES), since she was about four years old. 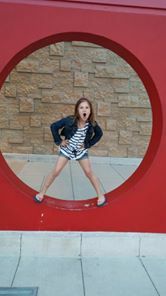 On this particular visit, she showed me how easy it is to walk on a narrow ledge of rocks, wade in a freezing cold stream, or make herself part of the decorative artwork outside of the local Target store. Although each adventure bore some risk, it seemed like she knew her limits and pushed them with surprising courage. Amidst the concerned pleas from her grandmother, Sophia focused only on conquering the next challenge, then smiling at me as if to say, “You worry too much, Gramma.” Perhaps I do worry too much, you think? There are things I sometimes back down from because I am afraid the outcome will not be as I planned. Hmmmm? Time to rethink. I have always believed that God put adults here to teach, guide and protect those little ones in our charge. But I am learning that God put those little ones here to teach us “grownup folks” how to open our minds to new thoughts, to guide us through the streams of challenge with laughter, and to protect us from being defeated by fear and forgetting to live our lives. Yes, Ashley, you did well with the choice of this child’s name. She finds value in the here and now and beauty in everything God puts before her. I personally have been very blessed by my summer tutor, fellow adventurer and, I hope, life-long friend: Sophia, the Wise.